Long distance cycling. Starting home improvement projects, getting them 90% done, and then getting distracted. Also, running! Oatmeal with chopped almonds before, handfuls of animal crackers during, hummus after. Or pizza at any point. I do most of my running solo, but a big part of my fitness comes from road biking with the PGH area cycling scene. Getting down to 3:02 would be nice. A nonstop ride from Pittsburgh to Erie and back has been on my list for a while. Eat lightly, but eat often. Keep the rubber side pointing down. Keep turning the cranks and you’ll get there eventually. I was a cyclist before I was a runner, and it was a thing to do in the winter when the roads were too bad for riding. Now I love to do both, all year round, because I work inside at a computer and I get antsy and restless and need it to blow off excess energy. It feels good to travel under your own power! 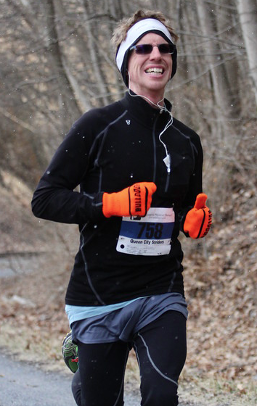 The Baker 50 Mile Ultra in 2015. I never thought that I’d be able to get up to the 50 mile distance, let alone finish 4th. It was a totally thrilling, and at times exhausting, day in rolling PA farmland and a nice mix of country dirt roads and wooded trails. 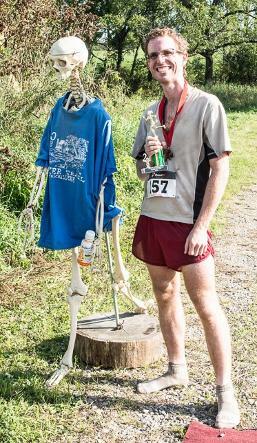 Great volunteers, great aid station food, and friendly people all around. Forcing myself to slow down and be patient was key. For me, it’s a way to experience a race with lower pressure, with no worries about pushing for a new PR, and to turn the marathon into a more social event while hopefully providing encouragement to other runners. Running WITH (not leading) the 3:05 group at Pittsburgh 2015 and actually clinging on to the end! It hurt, but was totally thrilling. I believe the key to preventing despair in any long-distance athletic activity is to make it social! I consider myself a GREAT listener and will be happy to talk! “Carbing-up” is a real thing! Sweet potato fries are my favorite the night before a race. Tapering is real and works, too…it’s OK to be a little lazy the week before a big race. Getting on a bike the day after is great to stretch out the legs and helps me a lot with recovery. Type II Fun: An activity that’s unpleasant at times while it’s happening, but fun in retrospect. We all need it to feel alive! I’m a regular donor to public radio! And also the local humane society.